Michael Rosenfeld Gallery, 2000, essay by Arlene Raven, PhD., 36 pages, 26 color reproductions. Spiral-bound hardcover. 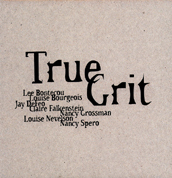 Artists included in this exhibition: Louise Bourgeois, Lee Bontecou, Jay DeFeo, Claire Falkenstein, Nancy Grossman, Louise Nevelson, and Nancy Spero.